Play Football Skills Camp took place on Wednesday, August 1 at the Youth Sports Complex from 6:00 PM to 8:00 PM. Fans will get the opportunity to get autographs from the Class of 2019 - Champ Bailey, Pat Bowlen, Gil Brandt, Tony Gonzalez, Ty Law, Kevin Mawae, Ed Reed and Johnny Robinson - as they visit Canton for the 2019 Enshrinement Week Powered by Johnson Controls. Fans will have the special opportunity to witness a gathering of the game's immortals to celebrate excellence at this photo opp on the front steps of the Pro Football Hall of Fame on Friday, August 2. The public is invited to this free event, and encouraged to capture the moment and share their pictures on social media. Fans preserved their football memories with autographs from Hall of Fame legends as they returned to Canton for the 2018 Enshrinement Week Powered by Johnson Controls. 12:00 p.m. - 4:45 p.m. 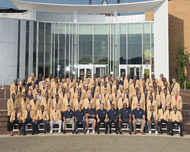 The greater Canton/Stark County community is proud to host the annual Pro Football Hall of Fame Enshrinement Festival. 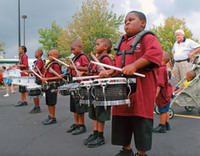 Join approximately 700,000 people at a wide variety of diverse events as they celebrate the induction of football heroes into the Pro Football Hall of Fame located in Canton, Ohio! A dedicated staff, team of more than 4,500 volunteers, and generous sponsors give the support necessary to plan and stage these action-packed festivities. ***Audio, video, photographic, and/or any other devices used for reproducing images and sounds of said events are prohibited without express consent of the Festival in the way of media credential or other specific authorization. Credentials are offered to the media for the sole purpose of reporting the events and depicting the same through written, audio, video, photographic media. All secondary, non-editorial, or commercial use of video, audio, photographic recordings, or other materials obtained through the use of media credentials is expressly prohibited.